We are a San Francisco Bay Area Tile Roofing Contractor providing expert Tile Roof Installations, Tile Roof Repairs, Tile Roof Maintenance and Tile Roof Restoration in Marin County, San Francisco, Sonoma County and Napa Valley. Durable, recyclable and energy efficient; Clay Tile Roofs and Concrete Tile and Concrete Tile Roofs are a perfect choice for sustainability. Additionally, their Class "A" fireproof rating provides assurances to property owners located within the wildland-urban interface districts, including San Rafael, Novato, Lucas Valley, Mill Valley, Corte Madera and Nicasio. Wedge Roofing's tile roofers prefer Ludowici Roof Tile, Boral Tile, Monier Tile, and MCA Clay Tile for their exceptional quality, uniformity, and color retention. From Napa Valley wineries and downtown San Rafael, to San Francisco's Presidio, the timeless beauty of a Clay Tile Roof celebrates the rich architectural style of California. A naturally green roofing material, Clay Tile has excellent insulation properties and lasts a lifetime. With a look of natural clay or slate, standard-weight Concrete Tile is a value-engineered alternative to Clay Tile. Available in vailable in a wide range of colors and designs, concrete tile is a durable, sustainable roof system. Most concrete tile products are Cool Roof Rated and compliant to green building requirements. For standard-weight re-roofing with concrete tile, structural analysis is necessary to determine adequate weight-load capacities of the building. Light-weight tile is a hybrid concrete roof tile designed to be less than 6.4 pounds per square foot. This roof system retains all the positive attributes of standard-weight roof tile and can be installed on any pitched structure. 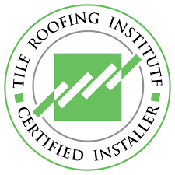 Many Clay Tile and Concrete Tile roof systems comply with ENERGY STAR® standards for solar reflectance and thermal emissivity to qualify as Cool Roofs and are rated by the Cool Roof Rating Council (CRRC) meeting California’s Title 24 requirements. We have been very pleased with the service, professional attitude and the crew."